For most repairs My Coastline gives you a choice of appointments. 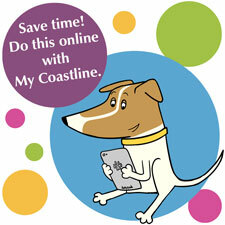 Or use the Coastline Housing App for Apple and Android devices, through which you can also send a photo of the problem. Urgent repairs must be reported by phone - lines are open 24 hours a day, seven days a week. Our contractor Blue Flame handles these repairs. You can email them or call our main number 01209 200200 and press option two. Urgent repairs must be reported by phone. If you think there may be a gas leak call Call Transco Gas Emergenciesthe National Gas Emergency Helpline on 0800 111 999. Most of Coastline Housing’s gas boilers fitted in recent years are manufactured by Worcester. Blue Flame are Worcester Accredited Installers and provide videos here to guide you in checking the pressure to your boiler, re-setting your boiler, and bleeding radiators. If you are at all unsure about anything shown in the videos, please do not attempt to carry out the instructions but call Blue Flame by dialling 01209 200200 and choosing option two. Click to read the repairs handbook which includes help and advice, including what Coastline covers, your responsibilities as a customer, and useful diagrams. If you are not sure how to describe a repair, take a look at the downloadable pictures at the foot of this page. They can help you find the right names for all sorts of things that might need repairing.